Dr. Kulbhushan D. Gulati, M.D. 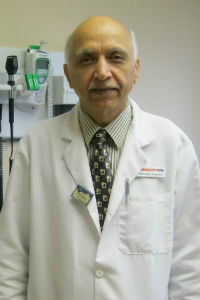 Dr. Gulati is a Board Certified Physician at Emergency One with over 25 years experience in emergency medicine. His qualifications include Emergency Medicine and certifications in advanced cardiac life support, advanced trauma life support, and pediatric advanced life support. Dr. Gulati studied and earned his degree at L.T.M Medical College in Bombay, India and completed his residency there as well. Dr. Gulati not only practices Emergency Medicine, but is also an Advanced Cardiac Life Support instructor. He has worked in the emergency departments of both Benedictine and Kingston Hospital and has been with Emergency One since 1995. Dr. Gulati is also certified to preform DOT Physicals under the National Registry of Certified Medical Examiners. As of spring of 2014, all DOT drivers MUST be have their biannual or annual DOT physicals performed by an NRCME recognized provider.